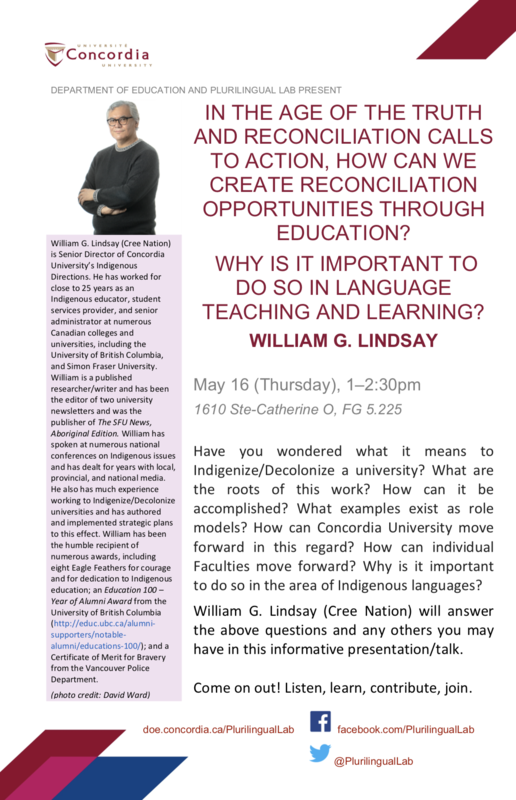 You’re kindly invited to William G. Lindsay’s talk on May 16, 2019 (Tuesday), at 1pm. This is a free event hosted by Concordia University’s Department of Education and Plurilingual Lab. Congratulations 2019/2020 SSHRC Award Winner! 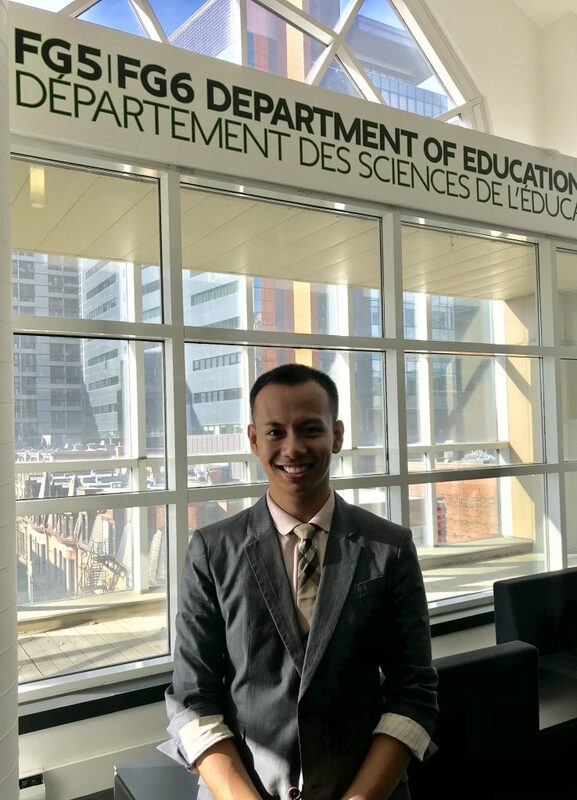 Congratulations to Plurilingual Lab member John Wayne dela Cruz for winning the prestigious Social Sciences and Humanities Research Council of Canada (SSHRC) Master’s scholarship. dela Cruz’s study investigates plurilingualism and pluriculturalism in a Francophone Cégep and identity of bi/plurilinguals. The results will help inform the practice of plurilingualism in schools, language policies, and professional development in plurilingual pedagogy for language teachers. We wish you all the best during the development of your research and look forward to seeing the results. 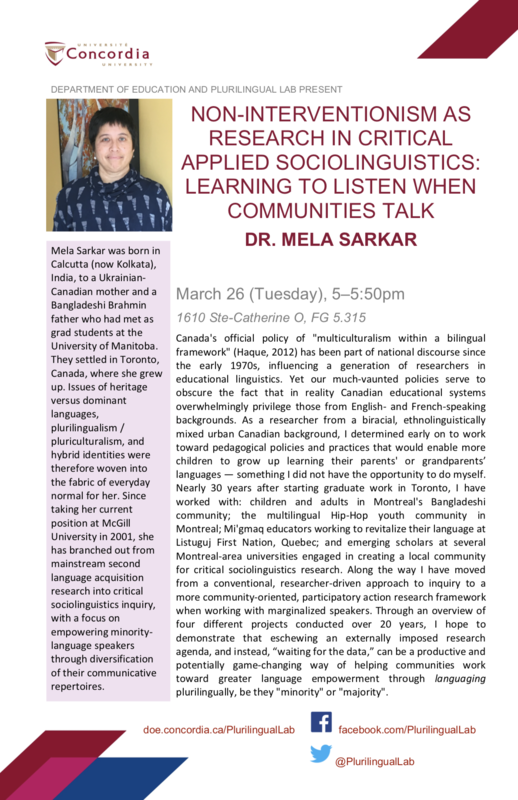 You’re kindly invited to Dr. Mela Sarkar’s talk on March 26, 2019 (Tuesday), at 5pm. This is a free event hosted by Concordia University’s Department of Education and Plurilingual Lab. 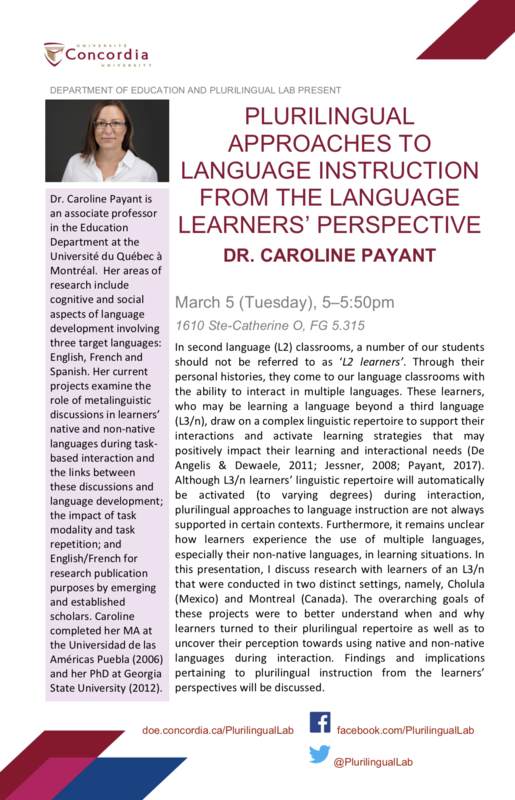 You’re kindly invited to Dr. Caroline Payant’s talk on March 5, 2019 (Tuesday), at 5pm. This is a free event hosted by Concordia University’s Department of Education and Plurilingual Lab. 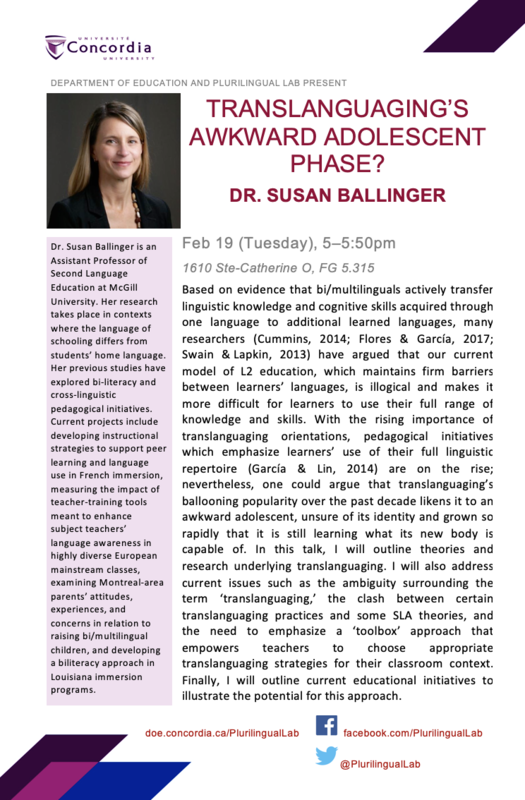 You’re kindly invited to Dr. Susan Ballinger’s talk on February 19, 2019 (Tuesday), at 5pm. This is a free event hosted by Concordia University’s Department of Education and Plurilingual Lab. Luiz Capitulino, 11, and his mom Sheyla Do Vale of Brazil embrace after becoming official Canadians during a citizenship ceremony at the National Arts Centre in Ottawa on Monday, Sept. 25, 2017. In Canada, 7.7 million residents speak a non-official language as a mother tongue, an increase of 13.3 per cent between 2011 to 2016, and the number of people speaking more than one language at home is on the rise. 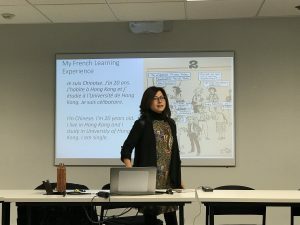 Using more than one language is not uncommon in Canada, particularly in metropolitan areas such as Toronto, Montréal and Vancouver where switching and mixing languages for different purposes is part of everyday life. East Pender Street, Vancouver. 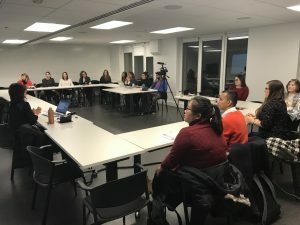 In Canada, using more than one language is not uncommon, particularly in large cities such as Vancouver, Montréal and Toronto, where switching and mixing languages for different purposes is part of everyday life. Canada is multicultural in addition to being multilingual. 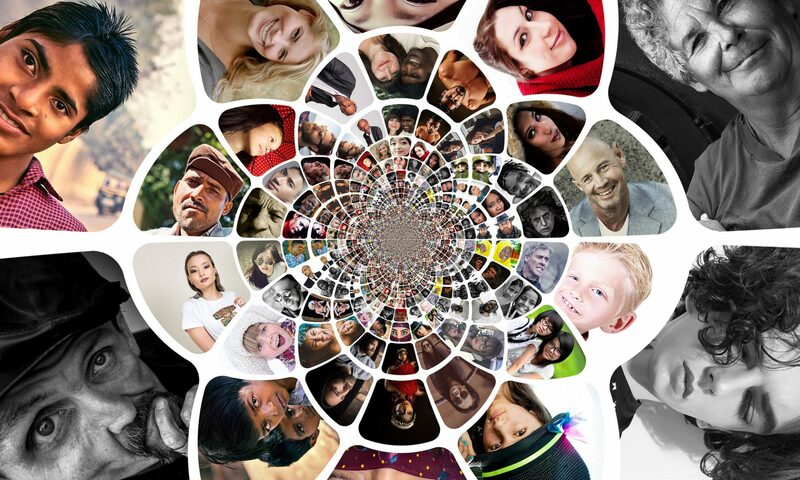 Cultural diversity is not only represented by immigrant cultures but also by diversity within Indigenous, anglophone and francophone groups. After all, these groups are both linguistically and culturally diverse in the sense that not everyone who speaks the same language and is part of the same cultural background speaks or behaves the same way. But the way English language programs have presented teaching English to students doesn’t acknowledge the diversity of multiple linguistic backgrounds. The category “English as a second language” — so common now it is frequently shorthanded to ESL — ignores the fact that many students find themselves in my situation: they are, in fact, studying English as a third, fourth or fifth language. Further, ESL programs often undervalue the use of more than one language to access information, communicate and use cultural knowledge in interactions with people from diverse backgrounds. In plurilingual language instruction, teachers focus on developing what linguists call a linguistic repertoire rather than the mastery of one language only. Plurilingual instruction values the use of languages, dialects (or varieties of language) as well as cultural knowledge that students have developed throughout their lives; they build on this knowledge to further develop proficiency in the new target language. For example, students learn strategies such as translanguating: when learning words in the target languages, they reflect on similarities and differences in other languages. And, as the language learner’s confidence grows with switching between languages, this also develops the person’s ability and confidence to make language choices and manage language risks in socially and linguistically diverse social settings. Thus, researchers believe that embedded with plurilingual competence is also pluricultural competence: learners experience greater comfort with, and enjoyment in, the fluid linguistic and cultural demands and opportunities of communicating in diverse societies. 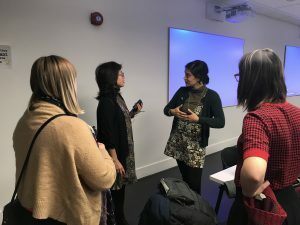 While plurilingual instruction is relatively new in Canada, many countries including Uganda, Spain and Mexico have introduced plurilingual instruction and reported benefits of linking linguistic and cultural diversity in language education. Studies based in Canada alone suggest that when teachers use a plurilingual approach language students gain opportunities to personally identify with multiple languages and value multiple strategies for language learning. Students also become confident and skilled in using different languages or a language mix depending on their location. Bilingual menu at Schwartz’s Deli, Montréal. In my most recent study, I examined plurilingual instruction in comparison to regular instruction that emphasized one language only (monolingual) in a university English language program in Toronto. I recruited seven teachers who taught the same program to 129 students but used different approaches. After four months, students who received plurilingual instruction reported it was beneficial for the development of cognition, linguistic and cultural empathy, relatability, critical thinking and willingness to learn more languages, among other benefits. All of the teachers in my study showed preference for plurilingual instruction and reported that it challenges cultural stereotypes and encourages students to be active, engaged learners who are empowered and confident with their own language use. While more research is needed to confirm these results, future research could also be done in classrooms where French is taught as the official language, or where any languages are taught to help our understanding of benefits of plurilingual instruction. 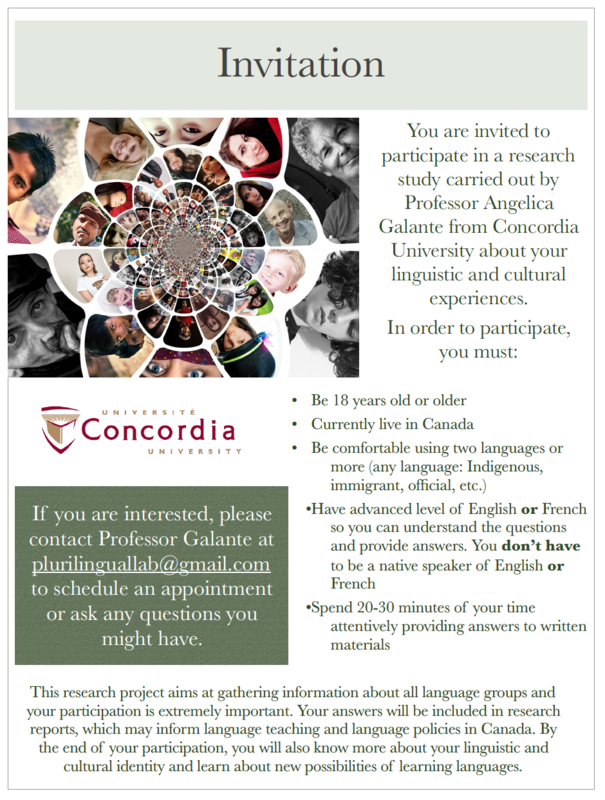 Would you like to help us improve language learning, teaching and policies in Canada? We’d love to hear from you! 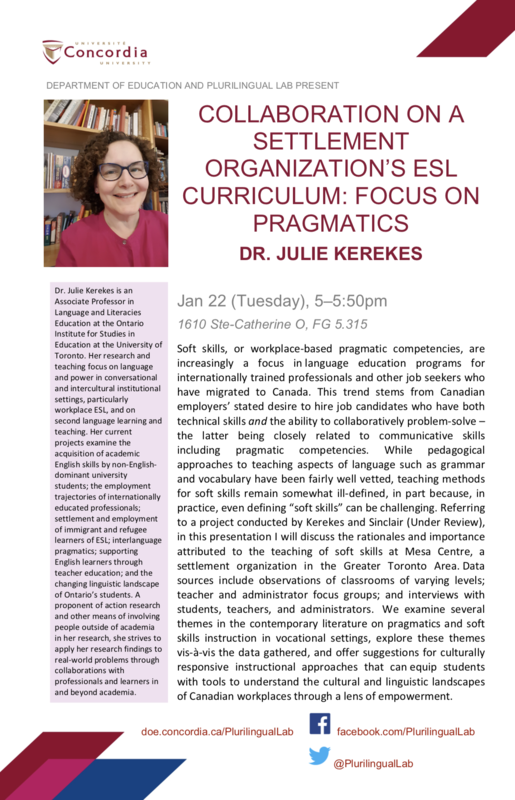 You’re kindly invited to Dr. Julie Kerekes’ talk on January 22, 2019 (Tuesday), at 5pm. 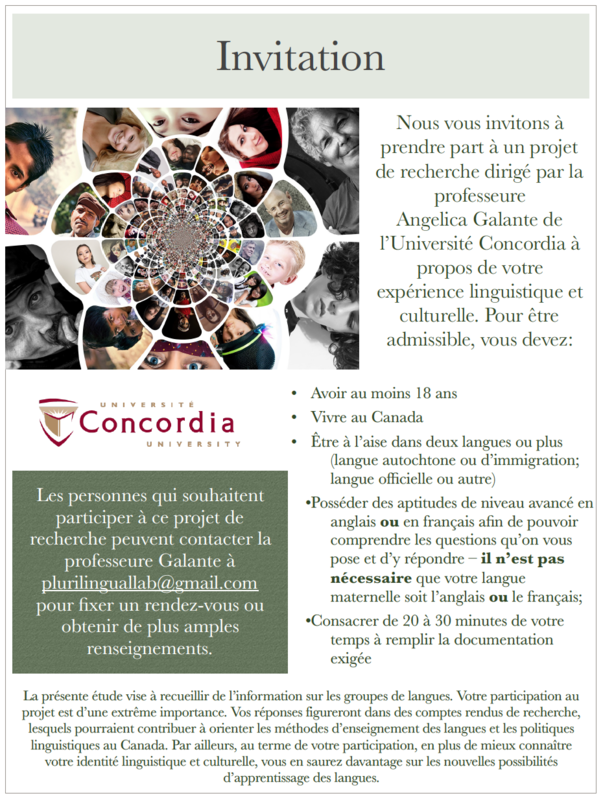 This is a free event hosted by Concordia University’s Department of Education and Plurilingual Lab. Concordia University’s Department of Education welcomed Dr. Sunny Man Chu Lau as the second presenter in our Plurilingual Lab Speaker Series on November 15, 2018. 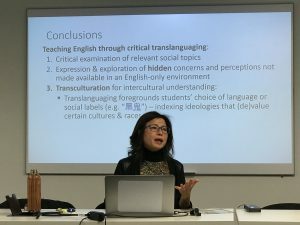 The talk entitled Affordances of plurilingual pedagogy for critical literacy engagement in second language classrooms gathered a roomful attendance by department professors and students in the Applied Linguistics (MA, PhD) and TESL (BEd) programs, friends and family. 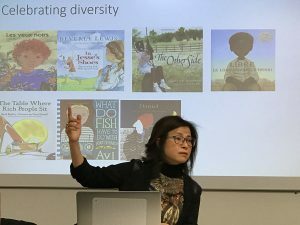 With a review of her three most recent research studies, Dr. Lau summarized the affordances that plurilingual instruction offer in engaging second language students towards critical literacy. 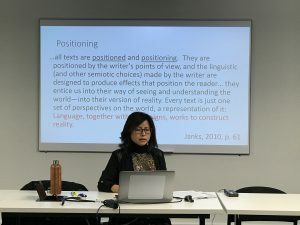 Texts—by virtue of the language in which they are written—are positioned and positioning; they serve to express the writers’ perspectives and to situate the readers within this point of view. Language learners and speakers are then subjected to the process of interpellation—they are constantly called to confront, accept, or refute messages with which they are bombarded. In Second Language Acquisition, we should always remind to ask ourselves, on behalf of students, why they’re learning something and what they can do with language; in other words, since languages are intertwined with lived experiences, language gains in the classroom should be as important as real life social practice. In plurilingual pedagogy, language is learned and used in meaningful ways. Language students can then be social agents inside and outside of the classroom, while the teachers can guide students, who become co-researchers in such social explorations. 3) intercultural understanding in the classroom, particularly in classrooms in multilingual and multicultural settings like Canada. Plurilingual Lab’s members thank Dr. Lau for giving this talk. To our growing readers and followers, we hope to see you in our third talk in the Plurilingual Lab Speaker Series by Dr. Dianne Querrien on November 29th.